How do I Choose the Best Turf Fertilizer? Turf fertilizer can adjust the pH and nutrient levels of soil. In order to choose the best turf fertilizer, you must first run soil tests to figure out how much of certain nutrients you will need to add to the soil. Phosphorus and potassium are both nutrients that have to be maintained in certain amounts in order for the turf to keep its green appearance. You may be able to find the fertilizer you need by visiting home improvement stores with extensive lawn care sections, or by visiting landscaping supply companies. Soil tests should be done at least once every year to check for proper soil nutrient levels. This will allow you to see if more of a certain nutrient is needed or if there is too much of another nutrient accumulated in the soil. Phosphorus is one mineral that can build up over time, especially when fertilizers containing the nutrient are used regularly. By testing your soil you will be able to better recognize which turf fertilizer to use based on how much of certain nutrients are needed or which ones to leave out entirely. Some areas may also need special care to avoid salt buildup in the soil. This condition results in what is known as saline soils and comes as a result of poor ground drainage and high water levels. You may be able to avoid this by making sure your water is of a high quality or by using turf species which are more tolerant of higher salt levels. Specialized turf fertilizer may also be available to use in high saline areas to prevent damage. You may need to try several turf fertilizer brands and types before you find the one that is perfect for your type of grass and location. Once you have completed your initial soil tests, you should have an idea of what nutrients your soil is lacking. The next step is to find a fertilizer that contains the recommended amount of these nutrients, and one that is made to work with the type of turf you are using. If a particular turf fertilizer does not seem to be working as you had hoped, then you may need to run further testing on your soil and on the turf itself to be sure you are not providing too much of anything in particular. Once you have determined that the vitamin content is not to blame, you may choose to switch brands to ensure that the nutrients are being produced in concentrations high enough to have an effect. What is a Compound Fertilizer? 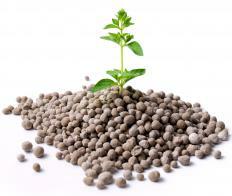 What are the Different Types of Green Fertilizer? What is a Fertilizer Spreader?